Rather than list every single shop on the West Street page and everything people could remember about them, I thought it would be easier to list them all here. This list doesn't claim to be exhaustive - it's a combination of stores I can remember, and ones people have told me I've forgotten. Each listing is from the east end to the west end, because that's the way I usually walk it. The list of current occupiers is correct as of December 2017. High Street News newsagents Mrs. Hills' traditional 'corner shop'. Founded 1993, previously Crown Brighter Homes decorators and Fabric House. 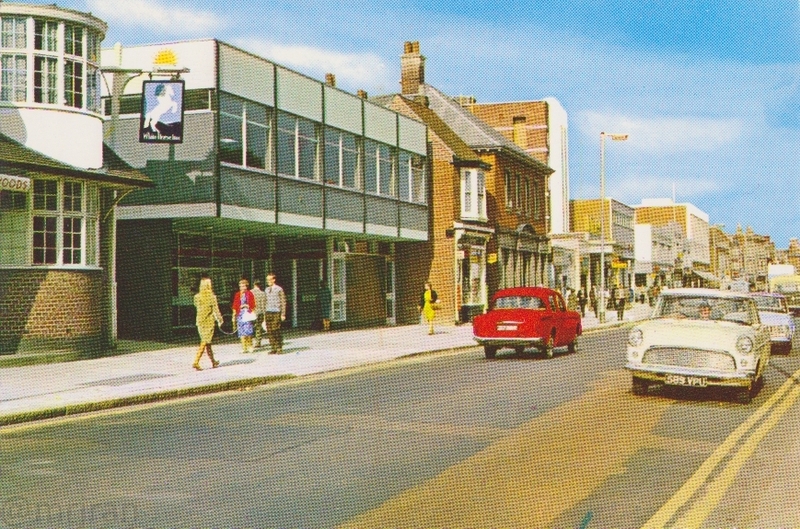 Verelle Hairdressing Ltd hairdressers Previously Keasts toy store, a large toy store which sold pushchairs too. A grand sloping roof has been removed. Used to carry Academy at no 5. My Dentist dentist Previously Whitecross Dental Care, Stationary Store (2009), Tracy's Furniture Store (1950s-70s) A grand sloping roof has been removed. Chaplins estate agents Previously Your Move. vacant Previously Batchelor & Son chemist. Tattoo Studio tattooists Previously Platinum Tattoo, Hill's greengrocers, Sutton stationers. vacant Previously Fareham TV & Audio Centre, AV World. Under both names carried Sony and Pioneer branding. Before that Phillips & Son. Pearsons estate agents Previously Millbank. Knocked through to next door, which was Davis World Travel. Three Joes restaurant Was vacant and used to promote Girl Guiding. Built 1981. Previously Dodges, Now Fashion. shopping centre entrance (Osborn Mall) Built 1981, on the site of Paragon Hotel, Pyle's Bakery, later Tesco groceries. Refurbishments include 2013. Quietest entrance of the three. Millets outdoors store Built on the site of Weston Hart and Pyle's Alley, before that The Coffee Lounge, Priory. Specsavers opticians Knocked through to former La Senza unit. Previously Stead and Simpson shoes and Conlessa. Sports Direct sportswear Supermarket unit. Previously Co-Op (2010), Somerfield (2004), Gateway, International Stores, Mac Markets and Macfisheries Food Centre. Lloyds Bank bank Previously branded Lloyds TSB, F Meyers Ltd dental surgery. Coffee #1 Previously Room, South Coast Furnishings, FADS, Credit Crunchers. Rowans Hospice charity shop Previously The Framing Centre, F Meyer's greengrocers, Home and Colonial Tea Stores - the advert can still be seen on the wall. British Heart Foundation charity shop Briefly Cheeky Cow milkshakes, previously Radio Rentals. La Gallerie Was an optician in 2002. Debra charity shop Previously Leeds Permanent Building Society. Star Nails and Beauty beauticians Previously NCH charity shop, Leeds Permanent Building Society and a cleaners. Coral bookmakers Previously Cafe Sorento, Going Places travel agent, Corbin's shoe shop. vacant Previously Boots Opticians, Oliver's. Approximate location of Forte's. Was re-built with shopping centre extension. shopping centre entrance (Westbury Mall) Built 1975. Refurbishments include 2013. Previously The Man's Shop/Norman Hyde and Harvey's. HSBC bank Follows through to Shopping Centre. Originally Midland Bank. Santander bank Previously Abbey (2010), Abbey National (1980s-2003), Harlequin Cleaners. Snooker Club upstairs. Hays Travel travel agent Previously Hadleigh, Fareham Toy Store, Dyers, Electrone Quip. Leightons Opticians opticians Previously Quality Seconds clothes, Pickfords Travel, The Compleat Bookshop. Burger King fast food Opened as Wimpy, with Rama hair studios upstairs. shopping centre entrance (Delme Mall) Built 1975. Refurbishments include 2013. Previously a solicitors, dentist and library here, also Halfords in the 1960s. Thomas Cook travel agents Previously Harveys, Birkett & Walsh. Had a snooker club upstairs. Poundland budget store Previously 99p Store, Family Bargains (2012), Woolworths (2008), Savoy House Cinema (1933-1959). Back end was annexed and raised to form Next in Delme Mall. Fondly remembered for its restaurants, chart music and pick 'n' mix. CEX gaming Previously Rosebys, Curry's, Harvey's. There was a tobacconist here. WHSmith bookstore Originally Woolworths. Part of the Savoy Buildings. Now incorporates Post Office. Greggs bakery Previously Weigh and Save, Snap, Dewhurst butchers, Gadsden. Part of the Savoy Buildings. Nationwide bank Previously Singer Sewing Machines, Netwears, Chapmans Laundry. Part of the Savoy Buildings. Argos Previously Tesco Home & Wear, Victor Value supermarket, originally Green Shield stamp shop, built on site of a house. Stones coffee shop Previously Ronald Wilson (jeweller), Coopers/Bollom, Bata, Share Drug Store, Dorothy Perkins, London Menswear, Zoe Clothing, Celebrations. McColl's newsagents Previously branded Martin's, then H W Bartlett & Son, John Turner Ltd, Lamb & Coleborn. Noble Hair Company hairdressers Previously Hug jewellers (2010), Ronald Wilson (until 2006), Halfords? Yoga Junkie Previously Reed, closed around 2011 and then re-used in 2018. A jewellers before that, then King & Power. Naomi House charity shop Oasis Recruitment upstairs, previously Top Drawer. Originally the site of the White Horse pub. H&T Pawnbrokers Oasis Recruitment upstairs. Originally the White Horse pub. Golden Touch arcade Previously Slot Casino (2010), Playland (2009), Smith and Vospers bakery. Sue Ryder charity shop Previously Hookies. Ramze Barber Shop hairdressers Previously Tiffany's, Novello. vacant Previously 131-4-Fun, The Money Shop. The Stubbington Ark Shop charity shop Local charity. Previously furniture store. Speedy Fix Phone Repairs repair store Previously London Camera Exchange. Headway charity shop Previously Sweets N Treats, B Tatford Family Butcher. Pizza Hut Delivery take-away Previously Santander, Alliance & Leicester, Hardings Family Repository. Abbey Electrics electronics Previously Techno Trade, Coleman's Camping Equipment. PK's Tattoos Piercings tattooist Previously Wain's and then Quarton's greengrocers. Skoolkit childrenswear Moved here from Trinity Street. Originally Connaught Territorial Army Centre. Vapourium vape shop Was HM Hair Design Group, demolished in 2016.
vacant Was Cash Converters. Now looks as if it's divided into two units. The 157 Store meanswear Previously branded One Five Seven. Kens Fried Chicken fast food Previously a hotel, and a gas showroom. Community Action Fareham Part of Church View House. Rebuilt in 2008 to replace a pub-club, known as (in reverse order): MODA, Pitchers, Daniels, Royal Oak. Big Pete's tattooist Part of Church View House, opened 2008. Previously Wools. Craft Crazy gift shop Part of Church View House, opened 2008. The Fareham Gallery art shop Part of Church View House, opened 2008. Costcutter supermarket Church upstairs. Building built in the 1960s, originally McIlroys department store. Later Heli-Beds, Classic Carpets, Jendenink Craftworks. Previously the King's Head pub. vacant Previously Trussel Trust Furniture Shop, Mckintosh Funeral Directors, Ideal Kit electronics, Deborah's and Solent Mobility Centre, originally McIlroys department store. Church upstairs. Cafe Imbizo coffee shop Previously Tino's Coffee House, Classic Carpets and Techno Trade - a huge electronics store. Church upstairs. Building built in the 1960s to house Pricerite supermarket. Fareham Community Church church Access to upstairs. Building built in the 1960s to house Pricerite supermarket. Before that there was a row of shops here, including Mrs Jemmet's sweet shop. South Coast Appliances electronics Part of Portsdown House. Previously (in reverse-order): Techno Trade, McIlyroy's, Dodge City, Pricerite supermarket. Lisa Edwards dress shop Previously ...by Lisa Marie, Bathroom World (2011), Bastins Schoolwear (2009). Part of Portsdown House. Smart Cut hairdressers Previously Excellent Cut, Digital Piano Showroom, then part of Kimbers. When I Grow Up Previously Kimbers Keyboards & Musical Instruments. Garden Shed Cafe coffee shop Previously The Hayward Studio. Domino's Pizza take-away Originally a hotel? Golden Boat restaurant Second-oldest Chinese Restaurant in town, the first being in Portland Street. Previously The Cresta Run Coffee Bar, popular with teenagers. Approximate site of Reynald's wallpaper and Arlington's Nursing Home. Current building built in the 1970s. vacant Thackeray House. Previously YMCA, the Job Centre. Orchid Thai Massage & Spa spa Previously Marked & Sparkling. N&S newsagents Previously Pyramid News, Bizzleys. Rama hair stuido was originally upstairs. Helpbox computing Previously Fareham PC Centre, The Kleen Machine, Ian Beauty Solutions, Pearsons, Glazer estate agents. Cafe Ethos coffee shop Previously West Street Dental Clinic (2010), SBK Estate Agents. The Childrens House Previously The White Cockade restaurant. JMS Financial Consultancy Upstairs. Previously FPR Tech, Addecco. Fox & Sons estate agents Built on the site of Righton & Bennett MOT garage. alley to back of shops Offices upstairs. Ask Italian Previously Butler & Cooke estate agents, Friday Ad. RBS bank Site of the Kings Arms pub. Tenant Network recruitment agency Previously Hampshire Feature Fires, Designer Kitchens. Site of the Kings Arms pub. Tiffins and Thalis restaurant Previously Cafe Tusk, before that GA Days builder's yard (1990s), Radfords (1960s), H Clark ironmonger. The Solent Club, which moved from a snooker club to a nightclub, was upstairs and closed after arson. The Ironmaster pub Previously The Tavern, The Market Tavern, Whitbread, The Brass Monkey, The Bugle. Knocked through to next door. Stephens Barbers hairdressers Previously Multivision. Iceland supermarket Built 2006 on the site of a car park. Before that Hinxman's garage, later Sergeants Cafe. Supercuts hairdressers Rough location of Gabbies burger bar, later West Street Arcade. The Crown pub-restaurant A Wetherspoons brand. Formerly The Crown Brewery (1840s), The Crown Inn (1900s). Nailz beautician Previously Tresmonds hairdressers, West Street Arcade (late 1980s). Beals estate agents Previously Manpower, which is now in Church Path. Natwest bank Originally the Market Hall / St Peter and St Paul's Parish Hall, Market House court. Previously Provincial Bank. Cafe Nero coffee shop Part of Market Quay development (2005). Site of Price's School? And the fire station. Previously Woolwich here. Kungfu restaurant Part of Market Quay development (2005), first leased to JJB Sport. Original fire station. Cremer Mall Outdoor shopping street, built 2005. Opposite the grandstand. Originally entrance to the cattle market, then toilets and a café were built here (2002). The Slug and Lettuce pub-restaurant Previously Vangard. Part of Market Quay development (2005). Before that there was a sports shop. United Reform Church pub-restaurant Occupied by The Vangard, now Slug and Lettuce. Before that it was a soup kitchen, then the Congregational Church. Goodman & Streat solicitors Portland Hall (Portland Chambers). Previously branded Warner Goodman & Streat and Warner's. Previously TSB, the Lecture Building, Town Hall, Corn Exchange, Portland Hall, a post office, Trustee Savings Bank, Portsmouth Savings Bank, UDC offices. Willows Furniture furniture Part of Portland Hall. Flower sales outside. Built 1835 to symbolise Fareham. TK Maxx clothing Part of Market Quay development (2005), previously a car park, originally Hants & Dorset and Southdown bus station (until 1992), Thackeray Cottage (until 1931). Wilko supermarket Part of Market Quay development (2005), previously a car park, originally Hants & Dorset and Southdown bus station. Used to be branded Wilkinsons. Betfred bookmarkers Part of Market Quay development (2005), previously car parking, originally the site of a Wesleyan chapel. Harper Way Taxi rank. Built 2005. Rough location of Savon. Westbury Manor museum and coffee shop Previously Fareham Urban District council offices (1932-1972), before that the town workhouse. There was a Southern Electricity Showroom on the corner (later estate agents). Every Cloud vape shop Originally Southern Evening News, then an office for The News. A-Plan Insurance insurance Previously Olan Mills Family Portraits (2008), Betfred (2005), Fareham Carpet Centre. Andrew Smith Salon Previously Capelli, Murray's Meanswear, Pines. Spin City arcade Previously Cheque Centre, Korda Coiffeur. Age UK charity shop Previously branded Help The Aged. Megabet bookmakers Previously Ladbrokes, Baxters. The Lord Arthur Lee pub-restaurant A Wetherspoons brand. vacant Previously Fast Tan. Part of Chequers House, was demolished in the 1960s. Once a three-storey Cooperative, with fabrics and electricals downstairs, clothes and furniture on the second floor, and a café upstairs. After that a gym. vacant Previously Cassino. Part of Chequers House. Once a three-storey Cooperative, with fabrics and electricals downstairs, clothes and furniture on the second floor, and a café upstairs. After that a gym. Lemongrass restaurant Previously Naz, before that Tung Sing. Rainbow charity shop Previously www.blindintuition.com (2010), The Well Christian Shop, Christian Books and Gifts and coffee shop, Franks Café, Fareham Camera Centre. vacant Previously Hampshire Sewing Centre, Wools? Papa John's take-away Previously Kallkwik, and a shoe repair shop. 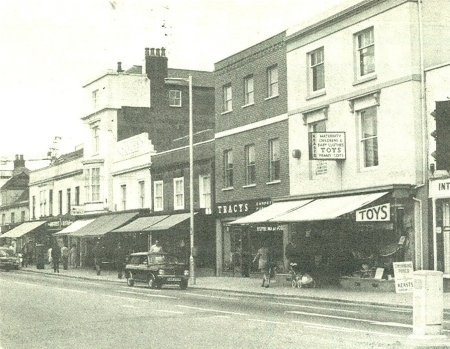 Kings Road Originally home to Maria's Café, Norman's barbers and Dorothy Grace florists. Snuffles Dog Grooming Previously Alterations. Part of Foresters' Hall. Heathen Chemistry Records record store Previously Gadget Repair Specialists, Tkuk, Park Place. Part of Foresters' Hall, once owned by Birks. The Bridal Suite dress shop Part of Foresters' Hall. Birks furniture Part of Foresters' Hall. Knocked through to next door. La Orient restaurant Previously E Birks Ltd, with Dragon Palace upstairs. Charcoal Grill take-away Previously Bodrum. 99p Store budget store Previously Zodiac Cash & Carry. Formerly a Cooperative, this one sold groceries, then Comet. Canton Express restaurant Previously The Pizza Place, Little Caesars Pizza, church hall. Oasis Convenience Store newsagents Previously church hall. vacant Previously Swinton - they moved over the road, previously Southern Evening Echo, Wimpy Bar, church hall. vacant Once a florist, it's on the site of the church hall. vacant Once a ladieswear shop. The Boutique Haberdashery Previously Sarah Jayne, Grandford Carpet Mills, Fareham Art Gallery. Legacy 4 Life Previously The Boutique Woolery, Simon's Barber Shop. Mac Shack Previously Fareham PC Centre, The Door Store. Vintage Tea Rooms tea rooms Previously Antiques of Fareham, Quickstitch. The Corriander restaurant Previously Rahuls Takeaway. Rovers Fishing Tackle fishery Knocked through to next door. Previously Beaumonts, Shirtking. Indian Cottage Restaurant restaurant Previously the notorious Star of Bengal? Anapuma takeaway Previously Perfect Pizza. Envy hairdressers Previously Curran Insurance Brokers. Judylou Cakes Previously Kree-ate-a-Cake, Abbey Electrics. Brown's Coffee House coffee shop Previously Kraftea Coffee, A Touch Of Class, Lloyds bank. Table Manners tea room Previously Flowers By Lucy, Fareham Nets, Rice Scholes and Blake solicitors. Grove Care Group Previously Millards, L S Vail estate agent. Traditional Fish & Chips take-away Previously Jack's Fish & Chips, W Hansons' fish and chips. Sea Of Spice restaurant Previously branded New Spice Indian Restaurant. Scientific Services (Paisley) Ltd Previously Bunce's Model shop.